Looking for a meal that will come together in just minutes, only requires a few ingredients, and your family will gobble up? 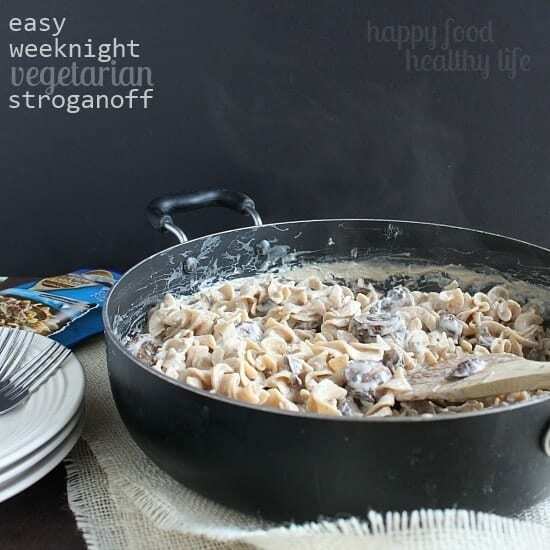 This Vegetarian Stroganoff is the shortcut you are looking for on a busy weeknight! 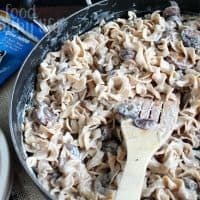 Yes dear, the mushroom stroganoff that I’ve been making for years, that you just love, that also seems to take a billion years to make because I make my mushroom gravy from scratch. Yup, I know the one. The kid loves it, but when it takes so long to make, I just don’t have the time to slave over the stove on a weeknight when there’s homework, chores, showers, laundry, and dishes to do. 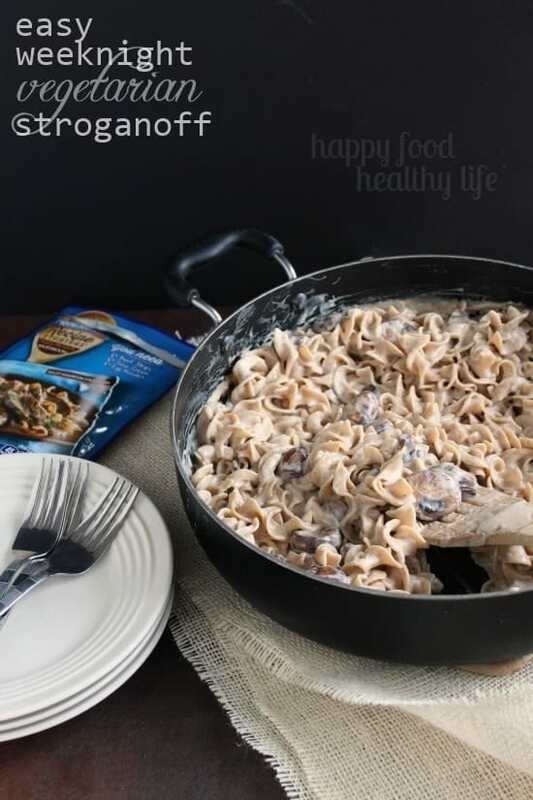 So when I was asked to try out this awesome Recipe Starter from Progresso and realized there was a stroganoff version, I was totally on top of it! All I had to do was substitute the steak strips it recommended on the recipe and use sliced baby portabella mushrooms, and we were good to go. As you know, the idea of using a mix from a box or package is not something I do often. Dinners are generally made from scratch in this mama’s kitchen. But can I tell you. 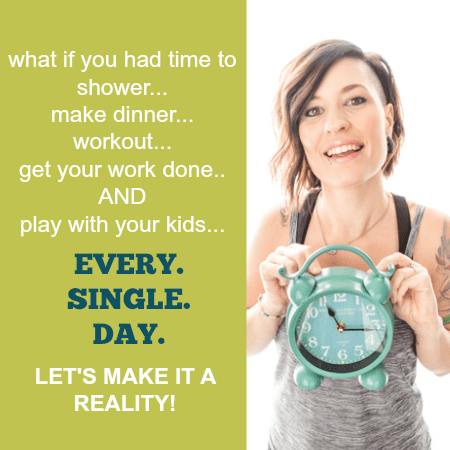 Acting as a single mom these days as a military wife and trying to run the household duties has kind of made me nutty. I’m overwhelmed by all the little (and big) tasks. My mind is all over the place and there never seem to be enough minutes in my day. So when I whipped this dinner up, I decided to time myself and see how long it took to come together. From the time I put my pot of water on the stove to start boiling to the time I put my hot and delicious pasta on the table, it took me a total of 24 minutes! You guys, that’s epic in my book. I actually didn’t even tell my kiddo that this was a different recipe from the one he’s used to me making (that takes at least an hour), and he didn’t say a word. He was too busy filling his mouth! 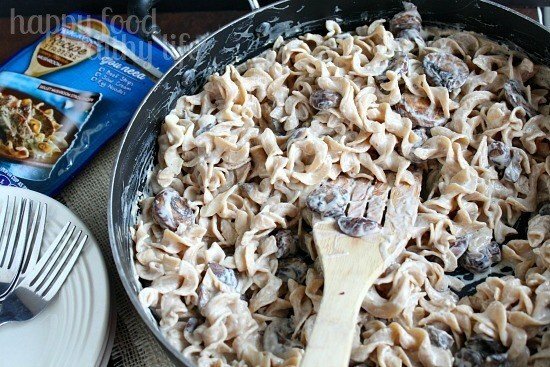 While the pasta is cooking, in a large skillet, brown mushrooms over medium heat for about 3-5 minutes, in a single layer, until the juices have begun releasing. Add the Recipe Starter sauce and sour cream, stirring occasionally for about 5 minutes, or until the sauce has thickened. There are five different Recipe Starter flavors, and I’m not sure which I’m most excited to try next. They all sound so delicious, but I’m guessing the Fire Roasted Tomato will be going in some sort of pasta and vegetable dish of mine soon. That looks and sounds fantastic. As moms, sometimes things need to give a little bit. It’s okay. In every picture I’ve ever seen of your son, he looks happy and healthy. I’d say you are doing a lot right. I think I will try this out. I usually cook everything from scratch too, well not the pasta. Sometimes there is no time though. Thanks for the idea. Phew! Thanks for the confirmation that I’m doing okay as a mom. Because seriously, some times I wonder! But my kiddo just loved this recipe just as much as the homemade version.